Being a long distance grandma, this Grandma looks for ways to be there in person for significant times in the grandchildren’s lives. Grandchildren love Halloween. Candy, of course! Whether a grandma lives far or near, Halloween may not be able to be shared in person with grandchildren, or a grandma may not want to personally go door to door with grandchildren or parents may want this “special” day to be their own. Whatever the reason grandma is not going to be in person at Halloween, grandma can still be that special person there. Just buy the costume your grandchild covets! Grandchildren remember when grandmas buy them something they dearly want. If you are near, go with the grandchild to pick out the costume. School Age Grandchildren. This Grandma gives the same caveat as for older grandchildren. Grandchildren are more sophisticated than we realize with the bombardment of media. Beyond that caveat, let the school age grandchild pick the costume of his or her dreams. Halloween can be a catalyst for telephone calls and emails between grandchild and Grandma exploring ideas. This Grandma loves the costumes by Chasing Fireflies. Yes, they are expensive but they are amazing. 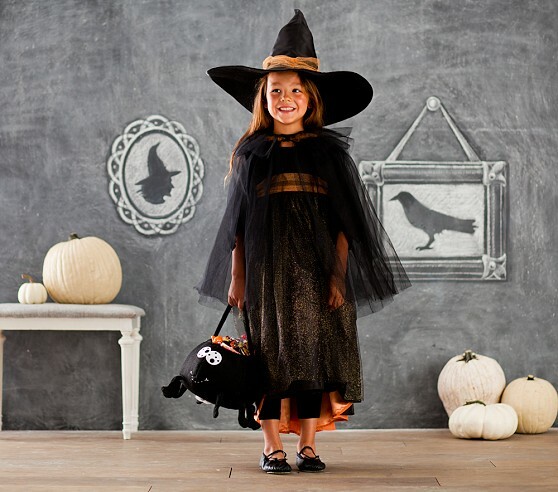 Check out Pottery Barn Kids is this Grandma’s second recommended go to place for Halloween costumes for school age children. They have glow in the dark costumes and even costumes of characters from Dr. Seuss books. Check out Pottery Barn kids. Preschoolers. This Grandma loves to see preschoolers in pajama costumes. Halloween riles children up and it is difficult to get the child to bed on Halloween night, much less to take off the coveted costume! Sugar high! Getting a pajama costume is a win-win, and the parents of your grandchildren will thank you. Again, the best are at Chasing Fireflies. They even have dolls and teddy bears that can have matching costumes, to go along with the gifted pajama costumes. Pottery Barn Kids is this Grandma’s second recommended go to place for Halloween costumes for preschoolers. They have the great “dress-up” costumes for firefighter, astronaut, superheroes (remember preschool is super hero time). Check out . Don’t forget the Disney characters. The Disney Store has inexpensive costumes for all the Disney characters that easily transition into pretend play costumes! My granddaughter was into Belle and the Belle costume was inexpensive, until we added shoes and accessories! Pottery Barn Kids has the cutest teddy bear costume, or elephant, lamb, owl, shark, butterfly fairy or bunny. Even their pumpkin and witch costume for babies are fabulous.